Think about it. When was the last time you used cash to pay for something? If you’re like me, you use online services for things like utilities, internet access and rent or housing payments. You pay mostly with credit or debit cards when shopping in stores or when filling up at the pump. Cash as a method of payment is all but dead. According to the Federal Reserve in 2016, only 35% of all transactions were made in cash. What’s more, most of those transactions were for dollar amounts of $25 or below. As a result of this shift, the U.S. $100 bill became the most circulated form of currency for the first time ever in 2017. It’s not that people are spending more $100 bills at the cash register — anyone who’s tried this knows the pain you have to go through to verify the bill’s authenticity. No, those higher value bills are now being used for savings. For investors interested in cash, my colleague Ted Bauman’s Smart Money portfolio has a much better option than stuffing bills under your mattress. But there is another way for investors to take advantage of this shift toward a cashless society. No, I’m not talking about credit card companies like Visa and Mastercard; they’re too old-school. And while Apple Pay and Google Wallet are excellent options, there are purer cashless payment companies on the market. Today, I’m going to look at the must-own payment processer for the coming cashless future. PayPal Holdings Inc. (Nasdaq: PYPL) is the granddaddy of cashless payments. The company got its start providing online payments for eBay before being spun off as its own company in July 2015. Since then, PayPal has broadened its horizons considerably. PayPal now sports more than 244 million users globally, putting it at the top of the online payment market. According to a Statista survey last year, PayPal was the preferred method of online payment for 39% of respondents, just behind credit cards at 42%. But PayPal is a solution for the credit card market as well. The company has recently launched its own cards in partnership with Mastercard. PayPal also owns Venmo, a popular payment app used to transfer cash between two users. Is your friend buying pizza tonight, but you don’t have cash? Just send them the cash via Venmo … problem solved. Venmo competes directly with Square’s Cash App, which recently saw more downloads than Venmo. However, the cash app market is huge. So there’s more than enough room for a couple competitors. Furthermore, PayPal’s Venmo has become so popular that the company processed more than $18 billion in the first quarter alone. Venmo is clearly holding its own right now. And that’s not all. PayPal has recently moved in on Square’s turf by rolling out PayPal Here. This point-of-sale app allows anyone to accept PayPal and credit card payments anywhere. All you need is a smartphone and one of PayPal’s credit card readers. With its finger on the pulse of the growing cashless society, PayPal has seen steady revenue growth of more than 20% since separating from eBay. What’s more, 2018 has been good to the company, with PayPal besting analyst earnings estimates in each of the past four quarters. Right now is an excellent time to buy into PYPL stock. The shares are up more than 22% off their May lows. Throughout this rally, PYPL has enjoyed solid price support from its 50-day moving average. In other words, investors have taken any pullback to this trendline as a bargain buying opportunity. 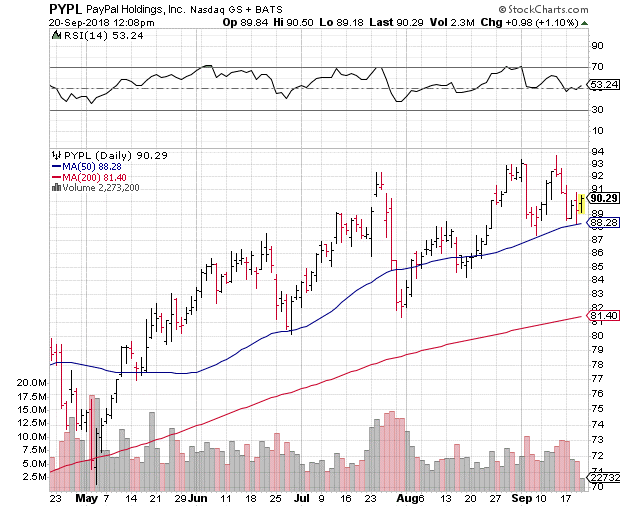 PYPL is currently in the process of rebounding off its 50-day moving average, meaning it’s prime for bargain hunters. What’s more, PYPL’s 14-day Relative Strength Index is hovering near 53 and trending higher. This means that the stock is not overbought, and that buying momentum is returning to the shares. Investors will want to be aware that there is the potential for turbulence in the $95 region, as you can see in the chart above. However, with the holiday shopping season just around the corner, PYPL stock should find the buying support it needs to break out and extend its recent rally. PYPL is a buy right now in the $88 to $94 range. Waiting until a breakout above $95 could be costly.